Andorra's total geographical area is 468 km². Thanks to its location, right in the middle of the Pyrenean mountains, it is home of 65 peaks of more than 2,500 meters of altitude. Andorra la Vella, 11km from the Spanish border and 33km from the French one, is located at 1,022 meters above the sea level. This makes places it as the highest altitude above sea level European state capital. The city has 74,794 inhabitants, according to the 2017 census. As well as in the rest of the country, tourism, commerce and the banking system are the city main economic activities, in which taxes are not paid (a new 4% tax called ISI has been recently added). This factor favors all kinds of foreign investment. 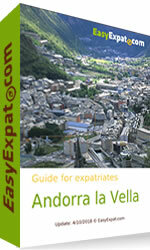 You can also discuss and share experience about Andorra in our forum.